Microsoft’s build releasing machine gun is up and running. The Redmond giant just released a new Windows 10 Creators Update build just three days after rolling out build 15002. The new Windows 10 build 15007 continues the trend set by the previous build by bringing a long list of new features and improvements. 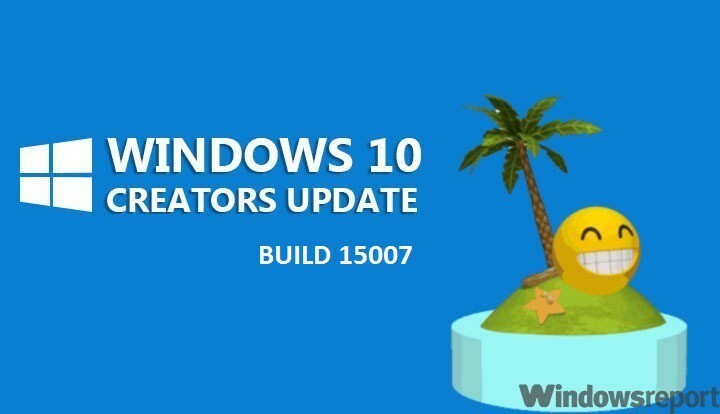 Build 15007 is available for both PC and Mobile. Without further ado, let’s take a quick look and see what’s new. Share your tabs: Open the “…” menu, select the new “Tabs you’ve set aside” button and go to the “Share tabs” option to share the tabs you’ve set aside with the apps installed on your PC. Import data: It’s easier to bring your data over from another browser when you switch to Microsoft Edge. Go to Settings, click the “Import from another browser” button and you can import your favorites, browsing history, and saved passwords to Edge. Run a download link directly: You can now run a download link without first saving it. Web Notes adapts to the Windows Ink experience: The full set of Windows Ink colors as well as the new slider released for Windows Ink with are now available in Web Notes. 2. Windows 10 users can download PC themes from the Windows Store through the Settings app. Simply go to the themes settings page, select the Windows Store as the source for your themes and that’s it. However, this feature is unresponsive now, but Microsoft should soon enable it. 3. Cortana helps you pick up where you left off. This new feature is very useful when you work on multiple PCs. When you switch computers, Cortana will display quick links in the Action Center to help you easily get back into the Microsoft Edge websites and cloud-storage apps. 4. Inline progress bar for notifications: App developers can now send toast notifications with a progress indicator to show download progress, exercise progress, etc. The upcoming build will add this feature to Windows Store downloads as well. 5. Scrollbar improvements for UWP: The XAML scrollbar for mice takes less space. The panning indicator now appears when you move a mouse over a scrolling region and the full scrollbar appears when you want to directly interact with it. Otherwise, it’s hidden. 6. Windows Hello enrollment improvements: Windows Hello now features visual guidance that tracks your face in real-time, shows you an improved progress indicator and gives you real-time feedback to quickly and smoothly set your face up for signing in. 7. New Bluetooth APIs: Build 15007 features new APIs that enable GATT Server, Bluetooth LE Peripheral role and unpaired Bluetooth LE device connectivity. 8. Keyboard navigation improvements for the Snipping Tool: Insiders can now take a screen capture using only their keyboard. Press Alt + N > select the desired snip type > hit Enter > use the arrow keys to move the cursor > press Enter to start selecting your snip area > hit Enter to finish the capture. 1. App reset: You can now reset your Mobile apps back to their original state. Go to Settings > System > Storage > navigate to the app > go to Advanced Settings > select Reset. 2. Use Cortana to control music playback and volume on your favorite music apps (EN-US only). With radio stations, you can ask Cortana to tell what song is being played. Say “Hey Cortana, What’s Playing” and this will work for all apps playing music. 3. Music recognition support to Chinese (Simplified): Cortana can now recognize music for customers in China. Tap the music notes icon on Cortana’s home page, and she’ll tell you what song it is. No need to install Shazam anymore. 4. Cortana sign-in using Azure Active Directory identity: you can now sign into Cortana with your work or school account instead your MSA, even if your organization doesn’t support MSA. 5. More recurrence options for Cortana Reminders: you can now set recurring monthly or yearly Cortana Reminders. 6. Microsoft Edge web payments: shopping sites can now make checkout easier using the payment and shipping preferences stored in your Microsoft Wallet. 7. Improved legibility for UWP apps in high contrast: Microsoft added the XAML framework to now display an opaque layer behind the text and coerce semi-transparent UI to be fully opaque. 8. Intuitive Settings: the Settings app is more user friendly and easier to use. There’s additional information on the right or bottom providing links to support, feedback, and any other related settings if available. App related settings are now available in a new category called Apps. 9. New device settings: this new page combines the Bluetooth and Connected devices pages to offer a single place to manage your devices/peripherals. 10. Pause Windows 10 Mobile updates: you can now pause updates on your phone for up to 35 days. To enable this feature, go to the Settings > Update & security > Phone Update > tap Advanced. This feature is available on enterprise managed devices on Windows 10 Mobile. The Netflix app displayed a black screen rather than the expected video content. The Outlook Calendar sometimes displayed the wrong date on its live tile after a new day had begun. Of course, Windows 10 build 15007 hasn’t fixed all the issues reported by Insiders. You can check out the list of known issues on Microsoft’s website. Have you installed build 15007? What major differences did you notice compared to previous builds?